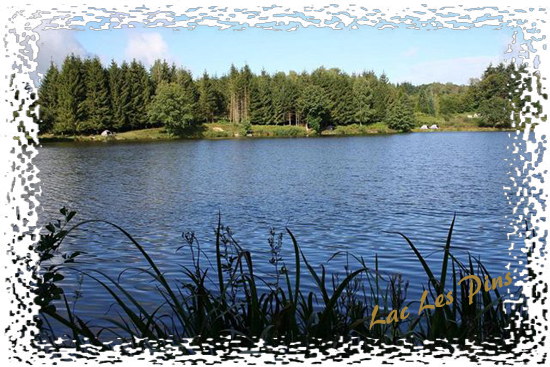 Lac Les Pins - One of the most prestigious Big Carp Fishing Venues in France - pay us a visit and you will not want to go anywhere else. We are John and Hazel Manton, a British couple who are realising our dream of escaping the rat race and are now the proud owners of this idyllic carp fishing lake in the Limousin area of France.John has been fishing in the UK since the age of 7 and has also enjoyed fishing adventures over the years at various venues including France, Spain and Holland, with the occasional big game fishing in some exotic waters in between. For the past 4 years he has been looking for a potential carp fishing lake or established carp fishing business that he can put his mark on, which we believe we have now found with Lac Les Pins. He is taking both his best and worst experiences to develop and enhance the fishery to provide the angler with modern-day equipment and facilities which we hope will encourage our customers to return year after year. Lac Les Pins is a beautiful 12-acre lake originally founded by 3 partners; Barry, Colin and Christine, also from the UK. Created from scratch, they have established the lake as one of the most respected fishing venues in the region. 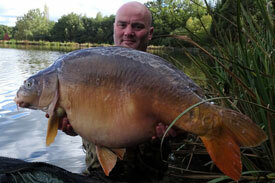 The main lake is stocked with carp up to 70lb. We have also introduced a stocking programme using a local reputable fish farmer to ensure the fishery's health and sustainability for many years to come. The first intake of new fish which have been hand picked will be ready to be introduced to the main lake towards the end of the 2019 season. 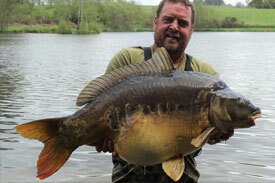 The previous owners built up one of the best stocks of large carp in France, so don't expect to catch much under 25lb. This is not an easy runs water where you will be up all night catching lots of small fish. This lake is specifically for enthusiastic and dedicated anglers wishing to catch large carp and sometimes you will need a lot of patience, but the rewards are great. Our focus is the quality of the fish which will give our anglers a challenge with a bit of a fight on their hands. This is real fishing at its best. We are a fully insured and registered fishery and are subject to checks by the French authorities that we conform to all standard regulations. Many lakes charge for all sorts of hidden extras so you end up paying for a lot more. We will maintain the pricing structure that is already in place and will continue to be one of the best and cheapest Inclusive Carp Lakes in France, so be assured that advertised price covers everything that is detailed in the package. Our aim is to offer a first-class level of service with totally satisfied customers all leaving with a desire to return. Whether you are a well seasoned angler or a novice on your first fishing trip, you can be assured of a very warm and friendly welcome, with superb facilities and great fishing. We would like to invite you to come along to join us on our journey and share this fantastic fishing experience. If you want a real fishing adventure with large carp, an exceptional value for money package and excellent service, we promise you will not be disappointed.